Britse oorlogsvlag ter zee vlag. 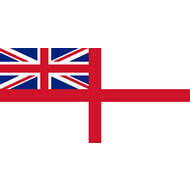 In British maritime law and custom, an ensign is the identifying flag flown to designate a British ship, either military or civilian. Such flags display the United Kingdom Union Flag in the canton (the upper corner next to the staff), with either a red, white or blue field, dependent on whether the vessel is civilian, naval, or in a special category. These are known as the red, white, and blue ensigns respectively.